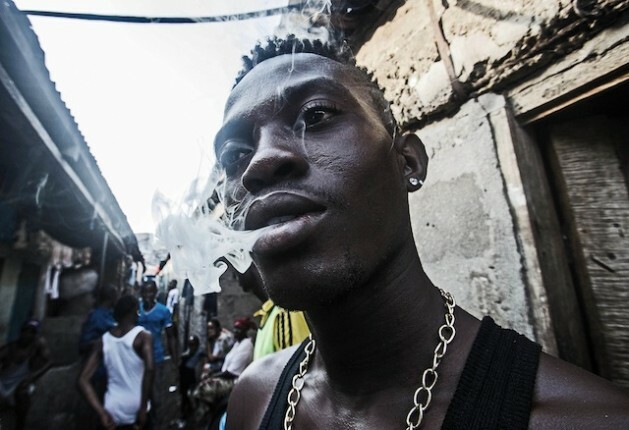 FREETOWN, Jan 9 2013 (IPS) - The air is heavy with the smell of marijuana as Gibrilla (23) expertly rolls a large joint at the Members of Blood (M.O.B) gang base in a poor neighbourhood of Sierra Leone’s capital, Freetown. He is part of a generation of young people faced with a chronic shortage of jobs, many of whom have turned to routine drug use as a way to pass the time and deal with the stresses of life in what is still one of the poorest countries in the world. Sierra Leone’s high unemployment rate is fuelling a culture of drug use among the country’s urban youth. Experts say the trend is responsible for acts of violent crime, while medical practitioners are concerned about serious health repercussions for long-term users, which the country is poorly equipped to address. In another part of the city, Patrick, who estimates his age as “twenty-something”, swigs from a plastic sachet of gin as he talks of his relationship with drugs. Patrick now feels he needs drugs and alcohol just to get through the day. “I feel hopeless when I don’t have them,” he explains. Alimu is not sure how much he takes every day, only that he spends all the money he can get on drugs and alcohol. Assistant Superintendent of the Sierra Leone Police Force, Ibrahim Samura, says he is alarmed by the “spate of drug abuse and addiction”. Samura says that there was a large increase in drug use and addiction during and after the country’s eleven-year civil war. “People used drugs to deal with the stress of war,” he explains. But he also says that drug addiction in Sierra Leone is tied to a lack of job opportunities. “It is more common amongst the unemployed vagrants, because they don’t have any work to do. (They) are the ones who spend most of their time in the…drug abuse bases or ghettos,” he says. Impoverished and traumatised youth even use drugs just to “kill boredom”, Samura says. Youth unemployment in Sierra Leone stands at a staggering 70 percent, according to the World Bank, and many drug users in Freetown say that if the government provides jobs for them, they will no longer feel the need to use drugs and alcohol. Ibrahim Jones, a Susan’s Bay resident sporting a ‘Fight Against Drugs’ wristband, also thinks reducing unemployment is crucial to addressing drug use. “People smoke because there are no jobs,” he confirmed. Samura says he is concerned about the relationship between illegal drugs and violent crime. 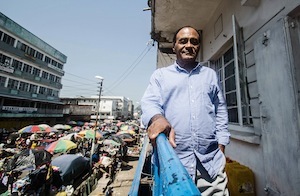 He sees drug use as closely related to an increase in “gangsterism” in Sierra Leone. “There are over 250 criminal gangs in this country,” he told IPS, displaying a list with names such as ‘Gang Killers’, ‘Blood Drain’, ‘Hisbola’ and ‘Da Elusive Thugs’. The combination of high-grade cannabis and other drugs, together with cheap but potent local liquor, is also having severe mental health repercussions for long-term users. “Drug abuse is a big problem in psychiatry in Sierra Leone today,” says Nahim, who runs a small mental health clinic in Freetown. He says around 80 percent of his patients, all of whom are between the ages of 10 and 35 years, are suffering from drug-induced psychotic disorders. “By the time they get to about 40 years they are dead from the physical and psychological complications of these drugs,” he admits. He adds that the problem is worst with young men, “but the girls are catching up now”. Sierra Leone lacks the means to effectively treat such victims of drug and alcohol-induced psychosis. Nahim uses what he calls the “cold-turkey method” to treat addicts, physically restraining them and administering “very strong tranquilising drugs” for sedation. “Then after ten days it’s over,” he says. But relapse rates are high. After treatment there are few safeguards to prevent patients slipping back into drug use. City of Rest Rehabilitation Centre is one of only a handful of establishments catering to drug users and the mentally ill on a longer-term basis. More than half of its 40 inpatients are suffering from drug-related problems. It is run by Pastor Morie Ngobeh, who uses religion and counselling to treat individuals with drug-induced mental conditions. “We rely on prayer, for God to renew their minds,” he says. Abdulai Bah’s family admitted him to City of Rest to deal with his chronic alcoholism. It is the second time he has been a patient there, but he feels that with a job waiting for him he will be able to stay off alcohol when he leaves in January. “Some of my relatives promised to help me start my own business. If I start to get myself engaged, I will not drink alcohol again,” he says with conviction.